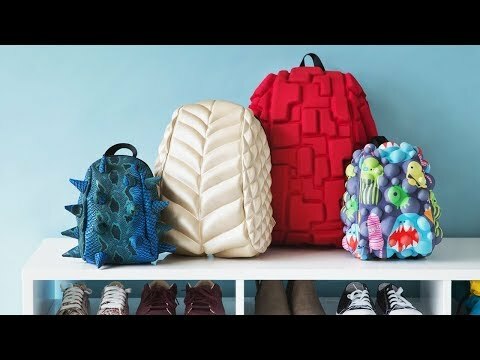 Stand out from the crowd with this dinosaur spike backpack. 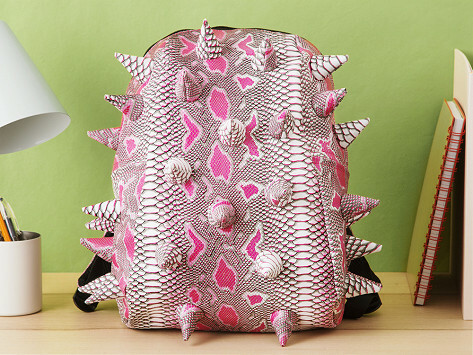 Its bold, three-dimensional design is a fun take on the classic book bag complete with dinosaur spikes. The vibrant designs will turn heads while keeping your stuff organized and accessible but won’t compromise function. There are sizes for the whole family, compartments inside and out, and the largest pack features a padded laptop compartment. Dimensions: Full: 18" x 14" x 8"; Half: 14" x 12" x 6"; Pint: 12" x 9" x 6"
Weight: Full: 1.6 lbs. ; Half: 1.4 lbs. ; Pint: 0.6 lb. The recipient loved his! Middle and high school hit! Grandson was over the moon. We put this unwrapped under the tree. Our 4 year old grandson as he was handing out the family gifts kept sneaking peaks at the interesting looking backpack. But he did not pick it up until the last wrapped gift was handed out. The grin and joy he experienced when he discovered that, YES, it was his new backpack was worth the wait. He put it right on. Make a statement in the classroom or office with MadPax’s bold, three-dimensional take on the classic book bag. With vibrant designs and origami-inspired forms, each pack will turn heads while keeping your stuff organized and accessible. Maker Tina Huber made the first MadPax for her son. It was such a hit she began creating bags for anyone who wanted a little fashion on their back without compromising function. These backpacks are more than just eye-catching. There are sizes for the entire family, from the littlest toddler to school-aged kids on up to adults. The largest packs have a padded spot for a laptop, and compartments inside and out. Whether you’re riding the school bus or commuting to work, with a MadPax bag, you’ll stand out from the pack.